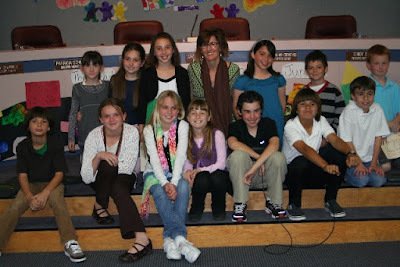 On April 28, our class shared "How Does a Story Get Published on this Blog" at the School Board Meeting. After the presentation, the local newspaper contacted us and wanted to write a story about our educational blog. The reporter wanted to know what we have learned from our blogging experience. Students have an authentic audience for their writing and that has an impact on the quality of their posts. Students revisit and reflect upon the lessons when they read the posts on the blog. The learning doesn't stop when the chapter or unit ends, commenting keeps the learning alive. Students learn how to navigate around the Internet and how to present digital information in a variety of ways. Students have opportunities to participate and contribute to an online community. Students practice a letter-writing form, when they comment. Students learn about geography by tracking our visitors and sharing comments with our blogging friends. Here are some thoughts about blogging from my third grade students. Clementine: I learned that a blog is an online log. If you put the words web and log together, you can see where the word comes from. WEB + LOG = BLOG. Matthew: Students around the world can be learning the same thing as us. For example, our blogging buddies, 2KM in Australia, were learning origami the same week we were. They made a swan, and we made a cup. We learned how to fold a swan from our 2KM buddies. Here is an image of the origami swans. See the pen, the cob, and all their cygnets? James: I learned about adding jpg images to a post. It is important to limit personal information on the Internet. Rather than having close-up images, we can crop a photo, go to PhotoShop and alter it, or recreate the photo with faces turned away from the camera. Emily: I learned about how a Voki works. A Voki is an animated avitar. Look on our sidebar, and you will see the orange Comment Kitty, our Voki. Press the red triangle, and she will tell you how to comment. Shane J: I learned not to put a lot of personal information on the web because the web is international. I know that the web is international because we have a ClustrMap on our blog, and it shows you who visited and where they live. I was shocked to see we got a reader from Japan. Chloe: I learned about plagiarism through this blog. For example, one group researched a topic and copied a sentence right from the source. That's plagiarism. We have learned to use our own words. Marcus: I learned how to type on an AlphaSmart computer. Taylor G.: I learned that sometimes people make mistakes, when they write a post. It is important to check your facts. Warren: I have learned that you should never click on advertisements on a blog because they're just selling something. Also, you could download something to your computer that you don't want. Amanda: I learned that sometimes people comment on our blog because they want you to buy something. Kyle: Comments make a writer feel happy. When I comment, I always include a greeting like, "Dear Shane J.," and a closing like, "Sincerely, Kyle". 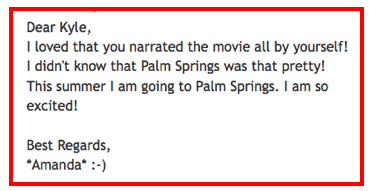 Here is a comment I got on my travel post about Palm Springs. Lexi: Learning how to make a hyperlink is very important. A hyperlink is an underlined word in a blog that when clicked, will take you to more information about that subject. In my blog post, Circling the Sun, I made a hyperlink to an image of the bright sun. Shane F.: I learned that you can’t copy sentences from other sources. That is called plagiarism, and it is against the law. We have learned to use synonyms to make new sentences. Garrison: I learned that if you have a lot of spelling, capitalization, or punctuation errors in your comment, it will get rejected by Mrs. Yollis. We make exceptions for commenters who are NOT in our class. Bethany: On this blog, I learned about copyrighting. It is important to ask for permission if you want to use someone's photograph or music. Sean: Typing paragraphs is easier now because I know how to type. I used to type with one finger, and that was slower for me. Alasia: I learned how to post a comment. A comment is a way to talk to a blog. When you comment you can give a compliment, ask a question, or give more information. Here is someone commenting on Mr. Salsich's educational blog in Connecticut. 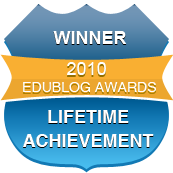 They are another group of educational bloggers that we follow. Taylor S.: I learned how to follow a hyperlink to gather more information. Also, I’ve learned how to add a jpg image to a post. Jonah: I used to not be good at taking pictures and I never knew how to type. Now I know how to zoom in and out on a digital camera, what angle should be used for certain pictures, and how to take a screenshot. Behyan: I learned that Mrs. Yollis rejects people's comments if they are selling something. Our blog is an educational blog, and we're trying to give knowledge, not sell products. Mrs. Levenson: Searching for new information can sometimes be frustrating, but I recently learned how to narrow my search simply by adding quotation marks around the words I'm searching. For example, if I want information about Lewis and Clark, I will search like this: "Lewis and Clark". 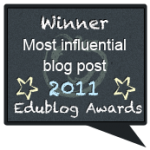 It has been interesting to follow other education blogs. (See the Blogs We Follow in the sidebar.) Our favorite is our 2KM buddies from Australia. Click here to listen to "The Hello Song" we sent to them! We realized that students all over the world learn similar things. Parents enjoy visiting and participating in the blog, too. I asked parents if they wanted to submit their thoughts for the Acorn post. While we initially had reservations regarding security and the policing of the blog postings, we’ve found that everything has been handled appropriately and most importantly, our child has been made aware of the power of the Internet in a very positive environment. We couldn’t be more pleased with how this program has turned out. I was further encouraged by the fact that all posts to the blog, both outgoing and incoming, are cleared through you. It has been both interesting and fun to participate in the class project. As students get older, there become fewer opportunities to participate in their classroom learning. Sure you can check to see if their homework is done or pepper them with questions for an upcoming test or quiz, but this has been different. My son comes home excited to tell me about what he or his classmates have posted to the blog that day and can't wait for me to see it and post a comment back. I'm amazed at the kids' creativity and have tried to encourage their efforts by regularly posting comments on their projects. I can't tell you the number of times my son has thought outloud about ideas for potential new projects he could post to the blog. He's always been a writer, but this has given him an outlet to be creative and practice his skills without feeling like it's work! I especially enjoy the tutorial movies where the kids get to teach others something they've learned. What a clever way to reinforce concepts. I hope his fourth grade teacher has a tech interest as well. I'd really like to see this continue to develop. Thank you for a fantastic year! 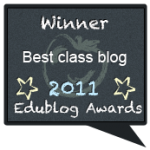 My husband and I would like to thank you for introducing the world of "blogging" to your students this year. Our son has thoroughly enjoyed the experience! Not only has it helped develop his writing and vocabulary skills, he has learned how to navigate through a computer. He has also learned a lot about geography while blogging with other countries around the world. It is so much fun to see the class communicate with other students in places such as Russia and Australia through the blog! We were amazed to see that there is even a translation button which can be used to communicate with students in countries where English is not the primary language. Lastly, we love how blogging helps children share their experiences with their classmates. Whether it be from a trip they took with their family, or an assembly they attended at school, blogging provides a safe and fun way to share with others. We hope that more teachers will get on board with this exciting way of teaching. Congratulations on winning the Digital Voice Awards. You are an inspiration to all! Kudos to you and your class for an outstanding job. Your article for the Acorn is very impressive. I read all of the blogs and agree wholeheartedly. This was a tremendous learning experience for Garrison, especially, how to write a blog with accuracy. The skills he learned from participating in this project will transfer into many subject areas that will remain a positive part of his learning for a lifetime. It was a surprise to the whole family to see how well he had enhanced his computer skills, as well as his typing. Thank you for all of the time, effort and hard work you put into this project to make it the ''Gold Standard". I hope it can become a part of the curriculum for all children in the future. What have you learned about blogging? Please leave a comment! We just wanted to thank you for making your 3rd grade class such an amazing and awesome experience for Shane and all the kids. It is such a reflection on you, when kids actually love to go to school. Shane looks so forward to being in your class and going to school. You have fostered such a love for learning in these kids. Watching them at the LVUSD meeting was so emotional. You could see the pride on all their faces. What an honor and experience for you and your kids. They have worked so hard to get where they are, and I know Shane has enjoyed every minute of it. He looks forward to logging on to the blog and checking out all the new posts and reading all the stuff that the kids write about. We personally want to thank you for taking such good care of our son when he is in your hands during the school day. We get such satisfaction knowing that he is so happy to be there. You are one of those few teachers in a childs life that he will always remember. We know Shane will be talking about you and his classroom memories for a lifetime. Dear Bethany! Thank you for leaving a voice comment on our monster voicethread! We love looking at your blog. It sounds like you've learnt lots about blogging! From your blogging friends in 2KM Australia! School is almost over. When school is finished I am going to miss all of you especially Mrs.Yollis and Mrs.Levenson! I hope we have more than 500 coments when school is over! Next year I am going to comment all of the time! We loved seeing the origami swans that you made! Very cute! When does your school year end? We will miss being your blogging buddies! We look forward to blogging with you next year! Do you think you will continue? We hope you will keep participating with us. You are our #1 international commenters. You asked when we get out of school. We get out the middle of June. Just a heads up about the Acorn article on your fantastic blog. The story is done, the picture has been submitted, but it won't run until May 28 because we had too many articles that had to get in this week. Thanks for your patience. I am a special education teacher taking graduate classes. 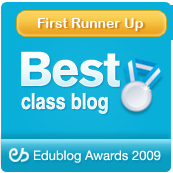 I am currently taking an Education and Technology class and we are learning about blogs. I happened upon your blog and I will continue to come back to it again and again. It is so very informative about how to blog, what to watch for, etc. Your projects are so very interesting and I'm sure you have learned soooo much this year. Your blog has taught me a lot. I am a teacher from Australia. I have just started a blog for my 2 year 9 math classes. I have enjoyed reading your class blog and the associated images. Older students still love doing origami too. 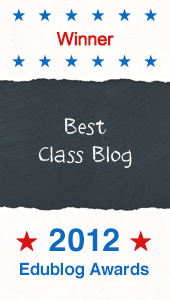 When your students reach year 9 blogging will be very easy and natural. A lot of my students have never used a blog, so I am also having to explain how to make a proper comment. If any of your students would like an older student friend (mentor?) from Australia, please let me know.